– Euribor (12 months), the interest rate normally used to calculate mortgage payments in Spain, rose 0.9% in December compared to the previous month, finishing the year at 1.242%. 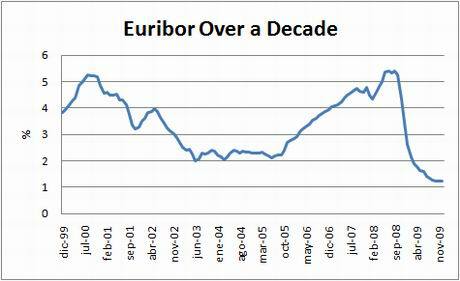 – This was the first monthly rise in Euribor in 14 months, suggesting that a change in tendency is on the way. – Despite the increase in December, Euribor is still 64% lower than it was 12 months ago. That means borrowers on annually resetting mortgages can expect some relief in their future mortgage payments. – As a consequence of the latest reduction in Euribor, repayments on a typical mortgage (150,000 Euros, 25 years, Euribor +0.75%) will fall by around 170 Euros a month, or 2,000 Euros a year. 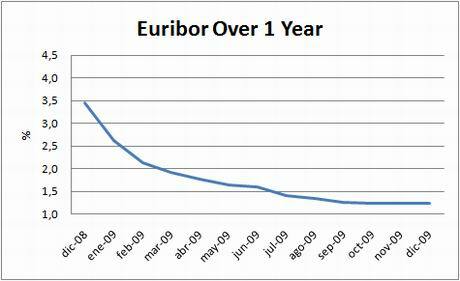 – Euribor is based on interest rates set by the European Central Bank. Base rates are expected to remain at 1% for the first quarter of 2010, rising gradually after that. – The volume of new residential mortgages signed in October was 52,451, down 18% compared to the same month last year, and 16% compared to September, according to the latest figures from the INE. In value terms new residential mortgages were down 31% to 6 billion Euros. – Last month I wrote that “the good news is the decline in new mortgage lending has been bottoming out in the last few months. It fell 31% in June, 19% in July, 7% in August, and 4% in September. If the trend continues new mortgage lending will soon be growing again year-on-year in volume terms. That will give some support to the housing market.” Clearly that is no longer the case. – New mortgage signings in Spain have now fallen for 28 consecutive months, often by double digits. That illustrates the severity of Spain’s property crash, even if official figures disguise the extent to which property prices have fallen. – The average new mortgage value also fell, by 15.8% to 113,882 Euros.